Before hard fruit such as cider apples and perry pears can be pressed to obtain their juice they first need to be milled; grated, chopped, shredded or scraped into a pulp. There are different size mills available, the choice depends on how much fruit you need to process. For plums, cherries and other stoned fruit a special de-stoner/pulper should be used first. - on the type of apple: early large juicy ones or small hard cider apples. - on the way the apples are milled: scraper mills producing mushy pulp, grater or chopping mills producing small pieces which hold the juice until pressing. - on whether you re-press or not: mushy apple pulp tends to clog the holes in the press sack and the channels in the pulp through which the juice flows out, just as happens with grapes, so the time spent re-pressing is worthwhile as you can extract significantly more juice. Customers with chopping mills have told me they usually do only one pressing in a hydro-press. With a hydro-press it's possible to extract virtually all of the juice, as with a Pack Press, but you may need to do a re-pressing. Note: if the apples are over-ripe they will have more 'mush' with the pieces. The same applies for pears, which are always mushy. A Belt press also struggles to press pears or very mushy apple pulp. A pack press is the best in that situation, with very thin layers of pulp. inside the hopper is a kind of auger which also prevents anyone reaching down to touch the chopping blades (Health & Safety requirement). The stainless steel chopping blades are the same as in the larger mill below, it's made by the same Italian manufacturer. 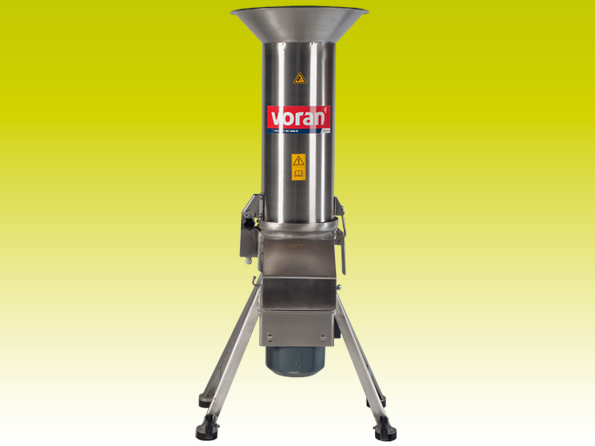 the top of the hopper is about 5 cm lower in height than the Speidel mill. The clearance under the pulp outlet is 35 cm. This is a high quality mill and should not be confused with similar looking but smaller and slightly cheaper mills. It comes with a short supply cable with 2-pin (+ earth) Schuko plug. You can buy an IP67 waterproof cable connector (eg. from www.toolstation.com 96672) and extend the cable with this. There is no electricity supply cable with the Speidel Mill, it has a blue Schuko type plug. Before loading apples into the hopper, switch the motor on first, or apples will jam between the blades and housing, so the motor will hum and not turn. It's quite noisy so I recommend wearing ear defenders. with a rotating 'tool' and replaceable screens/graters to adjust the size of milling. includes an 8 mm cutting screen/grater. includes a 9 mm cutting screen/grater. The RM mills above are mainly for apples, pears and other hard fruits and vegetables, there are optional different size graters. 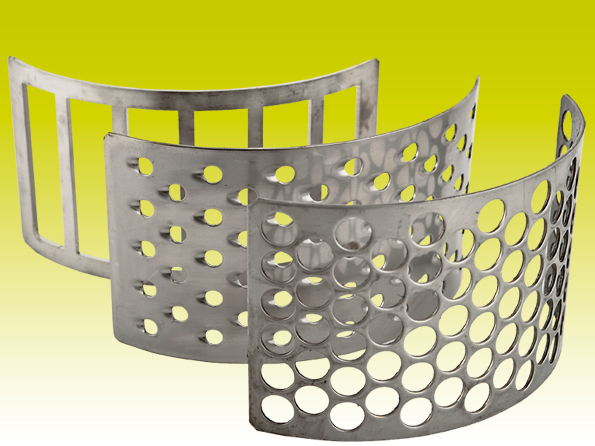 Advice is to use small-hole cutting screens for crunchy/fresh apples and larger-hole cutting screens for stored apples or softer apples. For leafy vegetables like Kale and Spinach or others with a lot of fibres the only Mill that really works is the RM 5.5 Version with a shredder disc. The shredder disc is installed above the standard RM 5.5 milling system, it cuts the long fibrous material into shorter pieces, afterwards the RM 5.5 mills as normal. The shredder disc must be removed for milling apples, pears etc; it's easy to change. The main use of the BG mills is for milling waste material, prior to composting. They give good results with leafy vegetables. They are not suitable for apples or other fruits because the rotating 'tool' is too fast and mashes fruits too finely. The rotating 'tool' on the BG pushes some material better through the sieve/screen than the tool installed on the RM5.5. the shredder disc is 266 mm diameter. the shredder disc is 300 mm diameter, up to 1500 kilos/hour of dry material (eg bread). The apples are sliced by hooked blades and crushed by serrated rollers. Whole apples can be put into the hopper, they don't need to be cut first, although it is faster if they are cut.